Civil War Historical Hat Pin Combo Pack - 3 Pins: Crossed Saber Cavalry Pin, Rebel / Confederate Battle Flag Wreath Pin, CSA Officer Pin - Cast Metal, Polished Golden Finish, Butterfly Clasp | BUDK.com - Knives & Swords At The Lowest Prices! 19th century crossed-saber cavalry reproduction: 2 1/2" x 1" / Full-color rebel Confederate battle flag framed by wreath: 1 1/4" x 1 1/4" / Civil War "CSA" officer reproduction: 2" x 1"
These historically inspired cast metal hat pins add authenticity and regal flair to any Civil War or 19th century cavalry garb and are perfect for re-enactments, plays, Halloween and more! 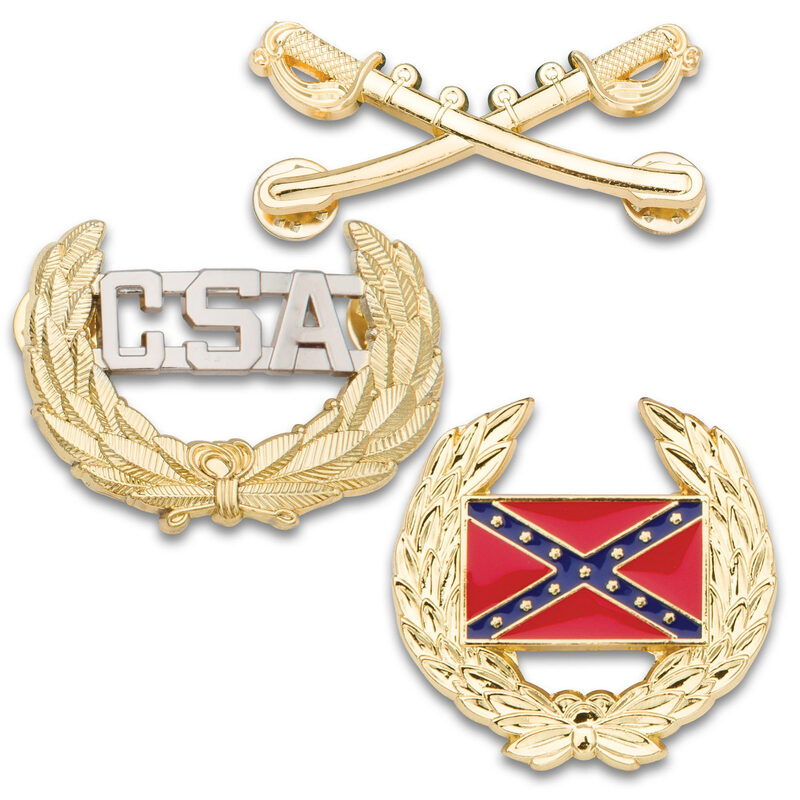 But don't be "pinned" down by labels - the Confederate- and historical cavalry-themed hat pins in this distinctive trio are great for more than just hats and historical costume applications. With their gleaming golden finishes, exquisite detail and timeless panache, all three are stylish enough for everyday wear. Show your Southern and/or rebel pride and pin one to your shirt, necktie or jacket lapel. Pin all three to your backpack, duffel bag or other gear for a bold, eye-catching look. Or set them in a glass frame to showcase alongside other Civil War memorabilia in a collection or historical display. The possibilities are practically endless!